The speed of light is nominally given by c/n, where n is the refractive index of the medium in which the light is traveling. Since the refractive index of free space is 1, it is natural to expect that light travels at c in free space. We show that this is not the case if one considers real beams that have finite transverse extent. The modification of the wavevectors comprising the beam result in a change in the phase and group velocities. We study the group velocity of single photons, whose arrival times are unambiguously established by a click in a single-photon detector. We generate time-correlated photon pairs via spontaneous parametric down-conversion. One photon is sent through a fiber delay of a fixed length; the arrival time of this photon is the reference time to which we compare the arrival time of the other photon, which we can choose to be either unstructured or structured. The structuring is done by spatial light modulators that can be switched on and off, hence allowing photons to travel through exactly the same optical path, much like in a race. We consider photons in a Bessel mode and a focused Gaussian mode, and show that in both cases, the reduction in group velocity results in a delay of several micrometers over a propagation distance of 1 m or ~30 femtoseconds in terms of arrival time. The effect is well-understood from a geometric argument and from a rigorous calculation of the harmonic average of the group velocity, and hence, is not anomalous at all. Our work highlights that, even in free space, the invariance of the speed of light only applies to plane waves. Jacquiline Romero completed her BS and MS degrees in Physics at the National Institute of Physics at the University of the Philippines Diliman. She was a university physics instructor in the Philippines while pursuing her graduate studies. Her research focused on using spatial light modulators (SLMs) for generating arbitrary optical fields for photopolymerization, microscopy, and imaging. Realizing the potential of SLMs for quantum optics experiments, she moved to the University of Glasgow after winning a Synergy Scholarship awarded jointly by the University of Glasgow and University of Strathclyde. Together with her research group, she pioneered the use of SLMs for single-photon measurements. Her PhD work explored both experimental and theoretical aspects of entanglement of spatial modes related to optical orbital angular momentum. She moved to the University of Queensland in 2015 to work on causality and quantum physics. In 2016 she started a Discovery Early Career Research Fellowship funded by the Australian Research Council. The following year she was awarded a L'Oreal-UNESCO For Women in Science Fellowship, one of four in Australia. Her research interests include addressing fundamental issues in quantum mechanics and developing quantum information technologies. J. Romero. 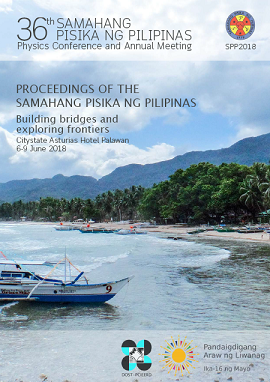 Slower light in free space, Proceedings of the Samahang Pisika ng Pilipinas 36, SPP-2018-INV-3E-04 (2018). URL: https://paperview.spp-online.org/proceedings/article/view/SPP-2018-INV-3E-04.